This entry was posted on February 26, 2012 by Megan @ When Harry Met Salad. 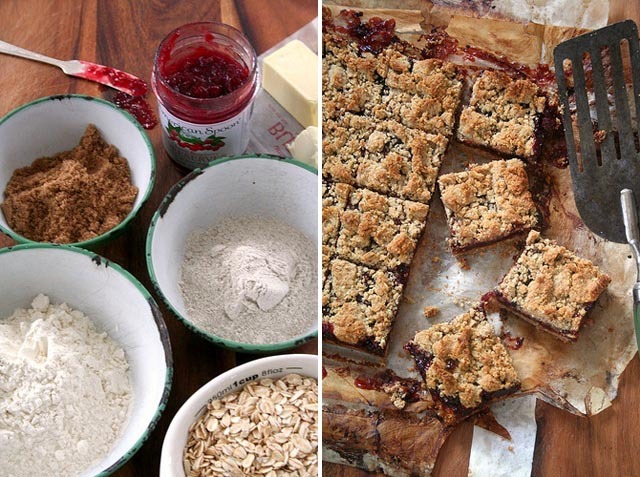 It was filed under baked goods and was tagged with baking with jam, crumble bars, jam, jam bars. Having grown up on the Keweenaw Peninsula of Michigan, I was hoping the Thimbleberry Jam would win. I have fond memories of picking as a child. I bet you never thought your job would enable you to meet Alice Waters. How fun, and congratulations on the win! Well, hello from Northern Michigan! I’ve never been up to the Keweenaw but everyone tells me how gorgeous it is. Maybe this summer. And no, I would never have imagined that someday I’d have an actual (albeit brief) conversation with Alice Waters. no cool stories, but lots of jelly. Thanks for the new idea. I love to glaze meat with my jelly spares. Oh YUM! Blackberry for me. Blackberry sounds excellent! Raspberry is traditional, and I used cherry-raspberry, but blackberry would be really lovely. It was! I just ate the last bite. Next summer, I will make plum just for this. I also have some leftover cranberry sauce frozen I thought might be good. Have you ever tried it with walnuts? Was thinking walnut in place of almonds and apple butter for filling. I always have a lot because I make it from all my apple scrap. By the way, I liked these even better the next day! Those look wonderful. I have a similar recipe and those things are like crack to me. You know what will take them to the next level? Chopped pecans. Trust me. Great idea! I’ll try that next time. Even slivered almonds would be nice. Or both! Simply amazing! What a great use for your ample supple of jam. Oh my goodness. I have not had any sugar for 5 weeks now (I sit here drinking a glass of beet juice at the moment), and felt the sugar cravings had finally stopped…until now. These bars look AMAZING. I am going to absolutely have to wait to make these until I have a party to throw or go to, because there is no way two people (me being one of them) could possibly be safe with an entire tray of these in the house. Uh-uh. This is my kind of dessert, though, I’ll tell you what. And how cool that you work for a jam company! Beet juice?! You must have amazing willpower. 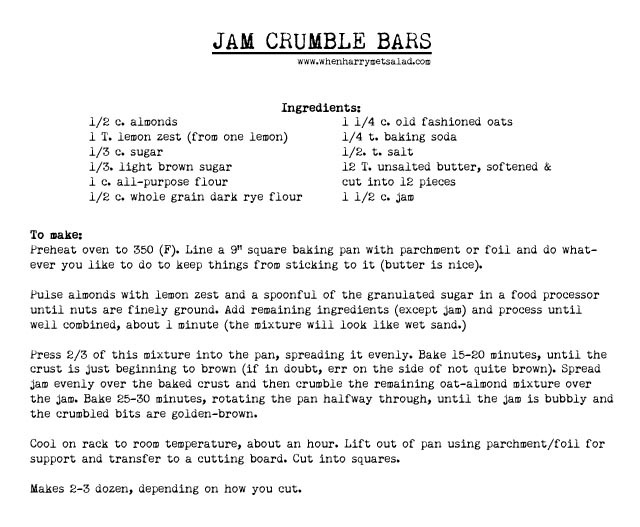 I took the jam bars right to work, where the jam came from in the first place. Because no, you cannot have 36 dessert bites tempting you from the kitchen counter. Beautiful! What a great way to use jam :) Great post! Love the pictures! 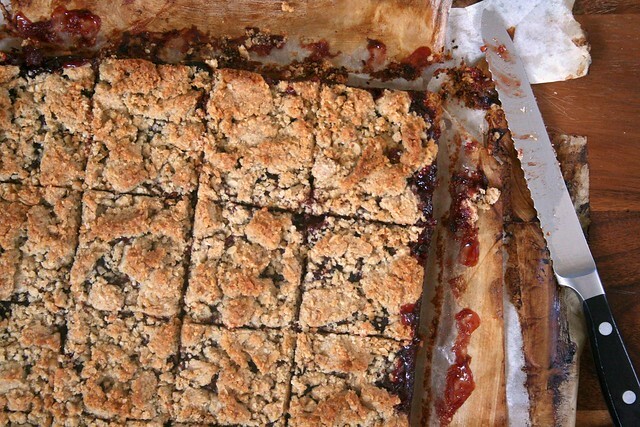 They jam bars look absolutely yummy and irresistible. I’m curious, what does the whole grain dark rye flour contribute to the overall recipe? Is it taste? Density? Consistency? This looks fantastic! Bars like this are my boyfriend’s favorite, so I am thinking I should be a nice girlfriend and bake this soon! With raspberry jam. Or blueberry. … Or I wonder how would it turn it with – instead of jam – peanut butter & honey. Or Nutella! My mum used to make something very similar to this when I was a little girl, but she did the topping with coconut, her mum made them for her when she was little. You’ve reminded me to raid my mums old cook books this weekend. These look delicious! I can empathize with having too many jars of jam/jelly/preserves/whathaveyou in the fridge to properly put away groceries – and I don’t even work for a jam company. There are just so many flavors out there I love and find and have to try I keep collecting them, without being able to eat them fast enough. 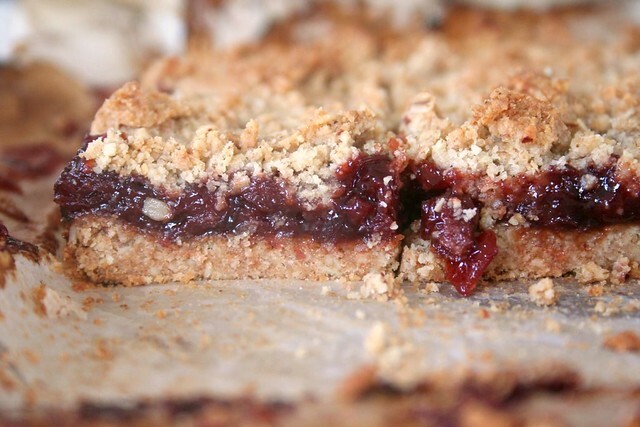 This crumble bar looks absolutely delectable, though, and will likely soon be using up a jar or two from my fridge. Then I can get different jams! That’s how this works, right? Oh and any sweets recipe with rye flour in it is so be-still-my-heart.